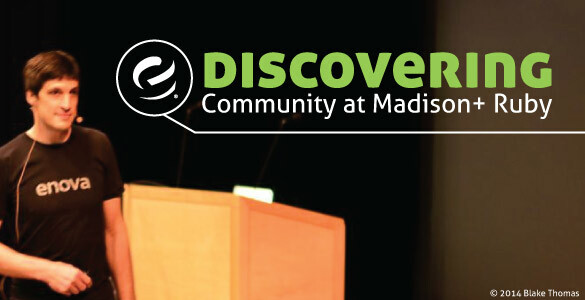 Madison+ Ruby Conference: A Window into Tech Community - Enova International, Inc. This description of the Madison+ Ruby conference taken from their website suggests, accurately, that the more mercurial and intriguing portion of the conference has little to do with Ruby. In fact, most of this year’s talks were focused more on critical ideas about humanity, empathy and thought than they were about any technology at all. It seems that if the Ruby community can be thought of as a living thing, then Madison+ Ruby would be its conscience. The talks that stole the show were all primarily non-technical. Perhaps the most compelling sessions of the conference were Liz Abinante’s presentation, “Unicorns Are People, Too: Re-Thinking Soft and Hard Skills” and Sharon Steed’s, “What Stuttering Taught Me About Marketing.” Liz made a compelling case that the language we use to describe skills is important, as it shades how we value them, while Sharon inspired us to embrace our imperfections, both as individuals and as companies, as part of what defines our identity. The conference was not without a nice slice of Ruby flavor in the guise of some stellar technical content. Prathamesh Sonpatki and Vipul A M built an Object Relational Mapper (ORM) on stage, Amy Wibowo explained how a passion project resulted in a machine able to knit meme sweaters, and Enova’s own Brian Shirai discussed how Ruby — specifically Rubinius — can help us attack complex problems by reducing our cost to experiment. These talks certainly provided the necessary Ruby garnish. Content aside, one thing that clearly sets Madison+ Ruby apart from other conferences is the sheer substance of their effort to promote the larger Madison community. At the end of the first conference day we were treated to a telling of the story behind Yumbutter — a successful local B-corporation — followed by a presentation and astounding musical performance from the folks at Madison Music Makers. I’d never seen improvisational R&B violin before — I assure you, it’s amazing. The last day was followed by a tasting of local cordials paired with vegan desserts. Everything, including Jim Remsik’s mention of Stella’s Spicy Cheese Bread and the Dane County Farmer’s Market as the reason the second day started an hour later than the first, was organized around a sense of local pride and flair. The conference sessions closed out with Coraline Ehmke’s talk urging us to consider additional sources and traditions beyond science (or more accurately before, as she was discussing alchemy) to draw from for our analogies and linguistic concepts — a spectacular talk in its own right. However, just before her session began, she reminded us that it was one year ago at Madison+ Ruby where she publicly announced her difficult experiences as a transgendered person. Then, as now, the community stood up and embraced her. I enjoyed Madison and I enjoy writing Ruby code, but the best part remains the community.